If you live in Ocala or a surrounding community and you are looking to change dentists or visiting a dentist for the first time, you may wonder what to expect at Weldon General & Cosmetic Dentistry. We want you to know that you will be treated with complete respect and courtesy. In addition, if you have had a long layoff from the dentist know that you are not alone and that we would love to get you back on track. We fully understand that you have your choice of healthcare providers and would be honored to earn a lifelong relationship! As a new patient, first and foremost, you will be greeted with a warm hello and a friendly smile by our front office staff who are happy to answer any of your questions and provide you with a beverage as you relax in our clean and comfortable waiting area. 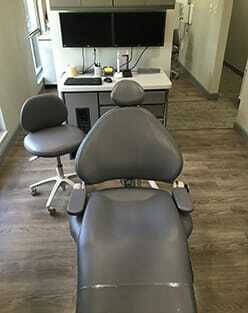 Once you have been escorted to the back, you’ll get a chance to enjoy one of our heating and massaging dental chairs that will help any nerves you might have quickly melt away. Dentistry often benefits from or even requires a more personal relationship than many other healthcare professions, so we make every attempt to help you feel at home. Your first visit with Dr. Weldon will include a review of your dental and general health history and a thorough examination of your teeth, gums and bite. We will ask what your overall goals are for your treatment. There is not one single treatment for every patient and we understand that the specific plan chosen to fit your needs and desires requires a coordinated effort between you and Dr. Weldon. The doctor will provide a diagnosis of your oral health situation and suggestions for treatment, some of which may be performed during the initial appointment. If you require more than just a basic cleaning and diagnostic x-rays, Dr. Weldon will describe what therapies he recommends to protect and restore your dental health and work with you on how to achieve the best possible results while remaining within your budget. If you have aesthetic concerns the doctor will be happy to discuss them with you and offer an array of choices for treatment. Together you will arrange for a second appointment that fits your schedule. To make your appointment faster and more fluid we have added some of our required forms. Feel free to print these, fill them out, and bring them with you to your appointment. Weldon General & Cosmetic Dentistry is an insurance friendly dental office serving Ocala Florida and the surrounding communities. That said, you do not need to have dental insurance to be treated here. We file dental insurance as a courtesy to our patients. Dental insurance plans have a large amount of variability across the spectrum of plans. In addition, many insurance companies provide several different dental insurance plans and many of them change regularly. Payment will be due at the time services are rendered for insurance and non-insurance patients alike. Due to the significant variety in dental insurance plans it is difficult to answer general questions. If you have specific questions about your own insurance benefits, we would be more than happy to provide a personalized insurance analysis. Feel free to call (352) 622-3236 or contact us electronically. We are happy to help over the phone, by email, or in person. We attempt to provide you with affordable, professional, and high quality treatments that are within your budget. We understand that much dental treatment is not planned so as a result we have attempted to accept a myriad of payment forms. Weldon General & Cosmetic Dentistry is happy to accept cash, personal or business checks, Visa, MasterCard, American Express, and Discover cards. CareCredit is a specialized healthcare payment plan. Click here to complete the CareCredit application. At the time of service, full payments for uninsured patients or the full co-payments for insured patients are due. If you have any questions about financing, insurance, or payments feel free to contact us and we are happy to assist you! In addition to your dental needs, we are committed to making this part of your care as easy as possible.